Mountain Camp is a traditional co-ed summer resident camp for campers entering 2nd-12th grades. We are located near Lake Tahoe on the shore of beautiful Ice House Lake in the Eldorado National Forest. Mountain Camp’s minimal technology, non-competitive program is designed to make sure each child succeeds. We work to create a fun and safe environment that encourages independence while nurturing lasting friendships. At a time when children are increasingly surrounded by computers, televisions, and video games our goal is to get campers outside, actively creating, playing and learning lifelong outdoor skills. Our program focuses on promoting a positive self-image, encouraging friendships and community, and practicing a healthy lifestyle. 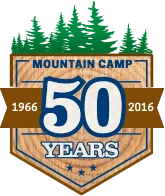 Mountain Camp seeks to illuminate the special and unique character in every camper; we want campers to shine. Ultimately, our goal is to have these experiences, friendships and laughter stay with campers the rest of their lives. We teach that communities are formed on respect, trust, and acceptance. Cooperation and teamwork are promoted above a highly competitive program. A balance of new experiences, outdoor exercise, creative arts, and sense of independence exists in a safe environment surrounded by supportive role models. Activities are designed to build confidence by rewarding effort and enthusiasm over proficiency. Campers’ sense of achievement is developed through setting and pursuing their individual goals.